Incomplete dominance is when a dominant allele, or form of a gene, does not completely mask the effects of a recessive allele, and the organism’s resulting physical appearance shows a blending of both alleles. It is also called semi-dominance or partial dominance. One example is shown in roses. The allele for red color is dominant over the allele for white color, but heterozygous roses, which have both alleles, are pink. Note that this is different from codominance, which is when both alleles are expressed at the same time. Why does incomplete dominance occur? As we have seen, it does not always occur with flower color; roses (and tulips, carnations, and snapdragons, among others) show incomplete dominance, but Mendel’s pea plants showed complete dominance. Incomplete dominance can occur because neither of the two alleles is fully dominant over the other, or because the dominant allele does not fully dominate the recessive allele. This results in a phenotype that is different from both the dominant and recessive alleles, and appears to be a mixture of both. This Punnett square shows incomplete dominance. The homozygous red flower has two dominant red alleles, and these are represented by the letters RR. The homozygous white flower is represented by rr. Their offspring are all heterozygous Rr, and they have pink flowers. This is the first filial generation, or F1. When the F1 generation cross-pollinates, their offspring will be RR, Rr, and rr in a 1:2:1 ratio. Some of their offspring (the F2 generation) will inherit two R alleles, some will inherit two r alleles, and some will inherit both. Incomplete dominance is not the same as codominance. In codominance, both alleles can be seen in the phenotype at the same time. Instead of being uniformly pink, a flower with red and white alleles that show codominance will have patches of red and patches of white. As with incomplete dominance, the F2 generation from heterozygous plants will have a ratio of 1:2:1 of red, spotted, and white flowers. Codominance is also shown in humans with AB blood type; the alleles for blood types A and B are both expressed. A child born to a parent with straight hair and a parent with curly hair will usually have wavy hair, or hair that is a little curled, due to the expression of both curly and straight alleles. Incomplete dominance can be seen in many other physical characteristics such as skin color, height, hand size, and vocal pitch. Carriers of Tay-Sachs disease also show incomplete dominance. Individuals with Tay-Sachs disease lack an enzyme that breaks down lipids, causing too many lipids to accumulate in the brain and other parts of the nervous system. This leads to nerve deterioration and loss of physical and mental abilities. Tay-Sachs occurs in people with two recessive alleles for the disease, and people with one allele are carriers but do not show symptoms. However, they do produce half of the normal amount of the enzyme, showing an intermediate phenotype between those with the disorder and those who do not have any recessive Tay-Sachs alleles. The Andalusian chicken, a type of chicken native to the Andalusia region of Spain, shows incomplete dominance in its feather color. A white male and a black female will often produce offspring that have blue-tinged feathers. This is caused by a dilution gene that partially dilutes the pigment melanin and makes the feathers lighter. When certain types of long and short-furred rabbits are bred, their offspring will have medium-length fur. This phenomenon can also be seen with the length of dogs’ tails. Also, an animal that has a lot of spots will have offspring with a few spots if bred with a non-spotted animal. This is often seen in dogs, cats, and horses. Allele – A certain form of a gene. Dominant – An allele that masks the phenotype of a recessive allele for the same gene. Phenotype – Observable physical characteristics from genes and the environment. Punnett square – A diagram that shows the possible outcomes of breeding between two individuals. 1. Which is NOT an example of incomplete dominance? B is correct. This is an example of codominance, not incomplete dominance, because both phenotypes are shown instead of one intermediate phenotype. 2. A rose shows incomplete dominance; when a red-flowered plant is bred with a white-flowered plant, the offspring are pink with the phenotype Rr. If these pink individuals are crossbred, what will be the ratio of their offspring? A is correct. One-fourth of the offspring will be RR and have a red phenotype, and another fourth will be rr and white. Half of the offspring will be Rr and show a pink phenotype. 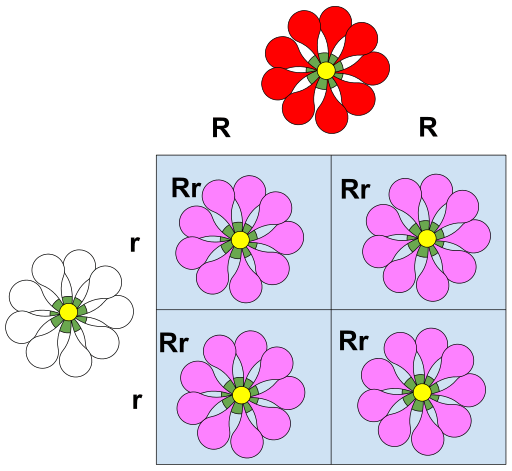 Choice C would be the result if the flowers showed simple Mendelian inheritance instead of incomplete dominance. The ratio of RR : Rr : rr would still be 1:2:1, but three-fourths of the offspring would be red, while one-fourth would be white.